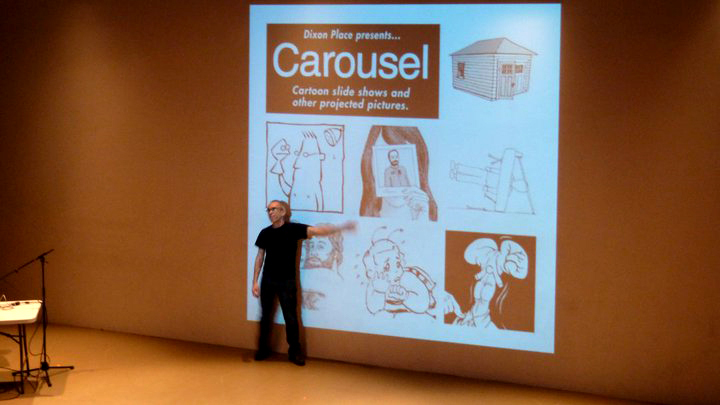 Since 1997, R. Sikoryak has hosted Carousel, a series of comics readings and visual performances by cartoonists and theater artists. Past shows have been presented in New York City at Dixon Place, the Brooklyn Book Festival, the Brooklyn Museum, The Brick Theater, The General Society of Mechanics and Tradesmen, Makor/Steinhard Center of 92Y, MoCCA, the New York Public Library, Parsons the New School for Design, Pen America World Voices Festival, Rubulad Home Base, Soloway, The Society of Illustrators, Union Hall, Union Pool, and NY Comic Con, as well as around the U.S. and Canada at Librairie Drawn & Quarterly, the Newark Museum, Asbury Park Comicon, The Center for Cartoon Studies, The Comics and Medicine Conference, MeCAF: The Maine Comics Arts Festival, Miami Book Fair, MICE: The Massachusetts Independent Comics Expo, RE/Mixed Media Festival, the San Diego Comic-Con, the Small Press Expo, the Toronto Comic Arts Festival, and Montreal’s Blue Met Festival. , Iris Rose, Flash Rosenberg, Laurie Rosenwald, Feifei Ruan, Johnny Ryan, Kevin Sacco, Sergio García Sánchez, Laurie Sandell, David Sandlin, Diana Schoenbrun, Ariel Schrag, Arlen Schumer, Anne Shapiro, Jason Shiga, Ryan Sias, Allison Silverman, Adrian C. Sinnott, Katie Skelly, Doug Skinner, Karen Sneider, Bishakh Som, Jeremy Sorese, Nadja Spiegelman, Ted Stearn, Leslie Stein, James Sturm, Connie Sun, Mariko Tamaki, Whit Taylor, Raina Telgemeier, Matthew Thurber, Jim Torok, Ted Travelstead, Andrea Tsurumi, Meghan Turbitt, Carol Tyler, Ngozi Ukazu, Marguerite Van Cook, Sasha Velour, Colleen AF Venable, Tillie Walden, Brian Michael Weaver, Lauren R. Weinstein, Steve Weisman, Jacqueline Preiss Weitzman, David Wells, Julia Wertz, Shannon Wheeler, Adam Whittier, Sophia Wiedeman, Kriota Willberg, Ian Williams, Ronald Wimberly, Jess Worby, Yao Xiao, Lior Zaltzman, ZEES, and more. Special guest voices and/or music have been provided by Scott Adsit, Sara Benincasa, Paul Boocock, Adam Conover, Shae D’lyn, Ralph Hamperian, Dave Hill, Lisa Hirschfield, McKenna Kerrigan, Julie Klausner, Dave Lloyd,Catherine Porter, Jackson Publick, Steven Rattazzi, Anne Shapiro, James Urbaniak, and Zero Boy, among many others. 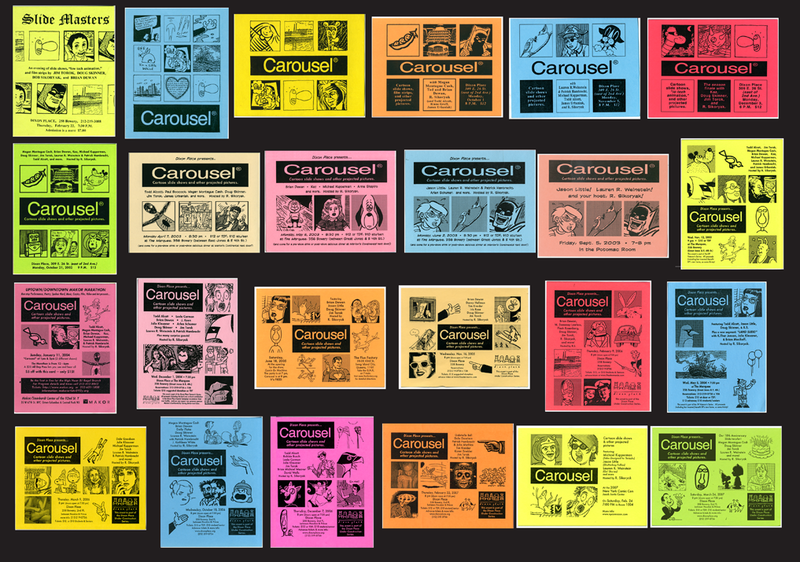 Carousel has also joined forces with The Center for Cartoon Studies, Nickelodeon Magazine, and various comics anthologies (including the Society of Illustrators‘ Comic and Cartoon Art Annual, Little Nemo: Dream Another Dream, Hotwire, and Typhon) to produce special theme shows. There have been collaborations on music shows with The Walking Hellos and other bands. 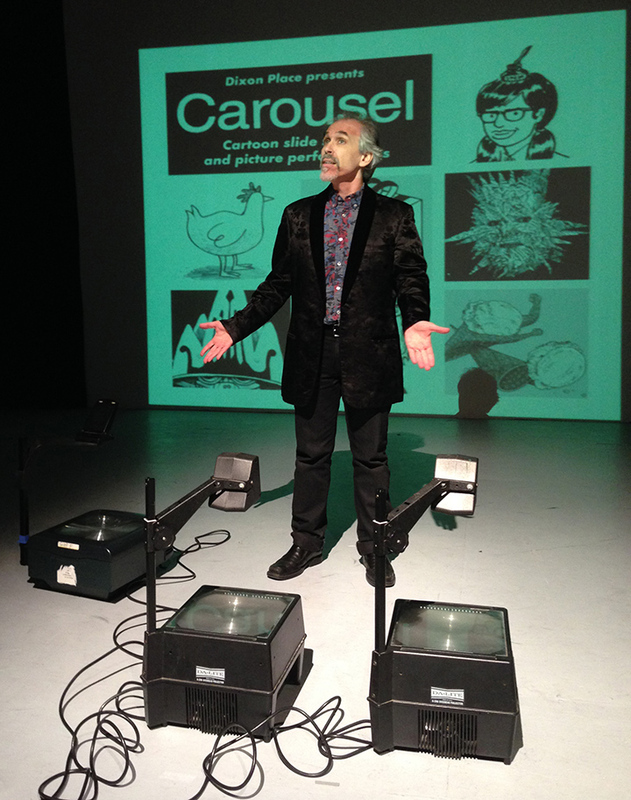 Kids shows, co-hosted with Neil Numberman, are part of the mix, too. The presentations are a hybrid, sometimes reminiscent of a radio show (usually with live narration, often with music and sound effects) combined with wildly creative imagery. From stick figures, to lush illustrations, to the occasional photograph, Carousel embraces all forms of visual storytelling. Some performers have also incorporated live drawing and painting, musicians, shadow puppets, video game environments, illustrated scrolls, drag, and dance into the show. While many presentations have a sense of humor, the stories vary greatly in theme; some are autobiographical, some historical or educational, and others are philosophical or fanciful. To get on the Carousel email list, please contact “rsikoryak(at)mac(dot)com”.